Why Use Ultrasonic Baths for Motorcycle Carburetor Cleaning? Checking the performance of your ultrasonic cleaner makes sense right from the beginning. While it may be a "stretch," you would not purchase a new automobile without giving it a road test to check its performance, would you? An ultrasonic cleaner investment may be considerable, and you want it to do what it is designed to do. And, as with your new automobile purchase, you'll want to develop a plan for regular checks to maintain the performance of your ultrasonic cleaner. Think of this as akin to a service record for your new car or your medical records kept on file by your family physician. A widely accepted means to establish an ultrasonic cleaner performance benchmark is called the "foil test." It is simple, very effective, and should be initiated as soon as you place your new unit in service. This provides you with a baseline that allows you to monitor performance on an ongoing basis. Conduct this test with freshly prepared and degassed cleaning solution formulations that you regularly use in your operations, and at the solution temperatures you normally use. Suspend them in the cleaning solution by hanging them over a wire – one in the center and the others at each end, but not touching the tank walls or bottom. This placement lets you test the efficacy of transducers bonded to the cleaning tank. Turn on the ultrasound. In a few minutes all foil sheets should display evidence of significant pitting, dents and holes, indicating that the cleaner is working properly. Retain the strips in a plastic sleeve marked with the date and the ultrasonic cleaner number to compare results with future tests that you should schedule on a regular basis. This simple test can be performed with a frosted glass and a No. 2 pencil. Draw an X on the frosted glass connecting the corners. Immerse the glass in the tank and activate the ultrasound. Record the time it takes for the X to disappear. This provides the benchmark for future tests. 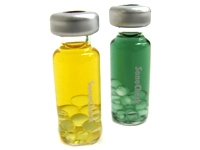 These vials change in color from green to yellow during the test. Contact iUltrasonic for SonoCheck Kits. Following operating instructions position the correct number of vials in an empty mesh basket according to the basket size. Lower the basket into the solution and activate the ultrasound. The color change from green to yellow indicates the presence of ultrasonic energy, and the time it takes to change indicates cavitation strength. If change does not occur or is uneven it indicates either failed or weak transducers. Results of the test should be recorded for future comparisons. Check the actual temperature of the cleaning solution against the set temperature on a regular basis. Once the solution has reached the set temperature turn the unit off and use a digital thermometer to get an independent reading. This temperature should not deviate from the set temperature by more than 2 - 3˚C. If excess deviations continue to occur contact the supplier or manufacturer. Check timer accuracy on a monthly basis. Set the timer for 15 minutes and switch on the unit. Use a stopwatch to measure any deviation. It should be less than 5% (45 seconds). If results are not satisfactory contact the manufacturer. Check cleaning power on a regular basis. Use a wattmeter between the unit plug and the wall outlet. Operate the tank without the heater on. The wattmeter reading should not deviate from the unit’s operating instructions power by more than ± 15%. If cleaning is satisfactory you can run the unit at lower power but inspect results more thoroughly. An absence of hissing and wave action results in slow or ceased cleaning. An electronic malfunction may be the cause. First try a reset by turning off the unit and disconnecting it from the power source. If reconnecting does not solve the problem or the malfunction continues to occur, return the unit to an authorized service point or manufacturer for repair. Malfunctioning transducer systems can be indicated by a complete system breakdown in which case the generator turns off and all control panel diodes go dark. The unit should be returned to an authorized service point or manufacturer. You'll find guidelines in the ultrasonic cleaner manufacturer’s operating and maintenance instructions. Always degas fresh cleaning solutions. Degassing drives off cavitation-inhibiting trapped air; the amount of time required depends on the volume of the cleaning tank. Degassing is accomplished by activating the degas mode (if so equipped) or operating the unit without a load. A uniform hissing sound, absence of large bubbles and a "blurred" solution surface indicates a degassed solution. Clean at the recommended temperature. This is provided by the cleaning solution manufacturer. Remember that as the unit operates the temperature of the cleaning solution will increase due to ultrasonic energy. It can reach 60˚C (140˚F) or higher. If higher cleaning temperatures are required, the ultrasonic cleaner’s heater thermostat can be set accordingly. If high temperatures can damage the products the installation of a cooling coil attached to an external water supply is recommended. Contact iUltrasonic for information on this accessory. Monitor cleaning solution levels in the tank. Each time you remove a basket of cleaned parts you remove solution coating the parts. Heat causes evaporation, which can be slowed by covering the tank during operation. This will also muffle noise. Damage can result when the tank is operating at less than capacity (either to the “fill” line or 2/3 full). Overfilled tanks will not clean satisfactorily. Extend Cleaning Solution Effectiveness. 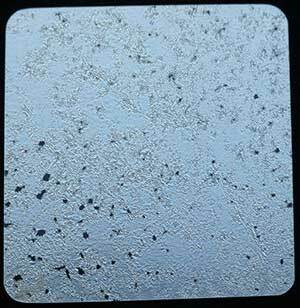 Dirt and contaminants removed during ultrasonic cleaning remain in the solution. Over time they build up and reduce cleaning solution effectiveness. Extending cleaning solution life can be done in several ways. A good practice is skimming off oils and other contaminants that rise to the surface. This also helps avoid contaminants adhering to cleaned products as they are removed from the bath. Some industrial-sized ultrasonic cleaners are equipped with skimmers; otherwise it is a manual process. Solution filters are also available to remove suspended solids in industrial sized equipment. When it is time to change the solution, it must be drained and disposed of according to local regulations. Take the time to thoroughly clean the bottom of the tank. This removes settled solids that will eventually cause serious damage. Follow the manufacturers’ tank cleaning procedures. Always remember that if your ultrasonic cleaner performance check results prove unsatisfactory do not attempt to repair your equipment. Instead contact the iUltrasonic professionals at for advice.